IRI – International Research Institute for Climate and Society | Why do we care about El Niño and La Niña? Why do we care about El Niño and La Niña? El Niño Southern Oscillation, or ENSO, involves large-scale patterns of pressure, temperature, precipitation and winds that affect weather and climate over both the tropics and, through teleconnections, regions outside of the tropics. For an introduction to the science of ENSO, see our ENSO Essentials page. 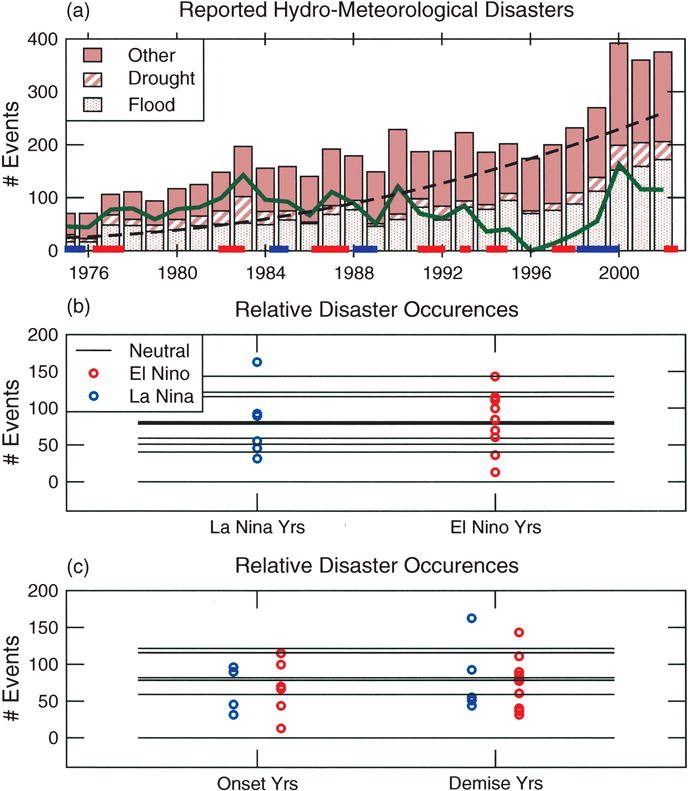 Scientists have shown that the occurrence of floods, droughts and other climate-related disasters is not statistically different among years with El Niño, neutral or La Niña conditions (see Figure 1). So why does the El Niño-Southern Oscillation, or ENSO, matter? The short answer: in years with El Niño or La Niña conditions, such disasters may be more predictable, allowing decision makers to take action and prepare for such events. Since El Niño and La Niña events can persist up to or more than a year, their effects on temperature and precipitation patterns can last over many seasons and lead to accumulating societal effects. How does ENSO affect climate and weather patterns? The most direct effects of ENSO on regional climate patterns are found in those areas closest to the tropical Pacific. During neutral conditions, Indonesia and other areas in the western Pacific experience more precipitation than in the eastern Pacific, such as Peru and Ecuador. However, during El Niño events, warmer surface waters in the tropical Pacific move eastward because of slackened trade winds. This leads to areas of low pressure and increased rainfall along the west coasts of North and South America. Conversely, the temperature of the waters in the western Pacific become cooler than normal, which leads to higher pressure and decreased rainfall there. Although many regions of the world can experience disasters in any year, certain locations tend to be particularly hard hit during El Nino events. For example, effects from past El Niño events include flooding and landslides in Peru and California (the 1997 El Niño caused $2 billion in property damages in Peru); forest fires and their ensuing air pollution in Indonesia; and droughts in northern Australia. Figure 1: Bars indicate number of yearly floods (light tan), droughts (hatched), and “other” (pink), which include windstorms and temperature extremes. El Niño (red lines) and La Niña (blue lines) events are indicated along the x axis. The solid green line represents the yearly total disaster occurrence, detrended using a second-order polynomial (black dashed line). The upward trend in disaster frequency reflects some combination of the following: the increased reporting of disasters, greater concentrations of people and wealth in high-risk areas, increasing vulnerability, and long-term changes in the frequency or severity of climatic hazard events. The yearly total disaster occurrence is thus “detrended” to estimate the influence of ENSO and climate on disaster frequency. From Goddard and Dilley, 2005. During neutral and La Niña conditions, the upwelling of cold and nutrient-rich water from the deep Pacific feeds and cultivates fisheries in coastal equatorial South America. When El Niño conditions occur, warmer water off of equatorial South America and weaker trade winds dampen the usual upwelling, reducing the amount of available nutrients. The lack of nutrients affects marine life throughout the food chain, resulting in severe impacts to the Peruvian fisheries. In 1972, due to a combination of overfishing and El Niño, Peruvian anchoveta fisheries collapsed. The 1997-98 El Niño also adversely affected the Peruvian fisheries and economy. During La Niña events, the trade winds resume and intensify, which increases the equatorial upwelling and extends the colder water of the east Pacific westward. The resulting effects are essentially the reverse of El Niño: the western Pacific experiences higher than average precipitation, and the flooding that results can be severe if it follows extended drought brought on by El Niño. Lower than average temperature and rainfall occurs along the western coast of the Americas, while Northern Australia can experience more frequent tropical cyclones. Can ENSO affect places far from the Pacific Ocean? Yes! Although the strongest signal of ENSO impacts is in the areas closest to the equatorial Pacific, El Niño and La Niña are such powerful forces that they can shift seasonal temperature and precipitation patterns around the globe. These shifts, known as teleconnections, occur via the effects of tropical sea-surface temperatures on the upper atmosphere. When different parts of the tropical ocean warm and cool and the pressure gradients shift, the atmospheric wind patterns also shift to alter precipitation patterns. Strong tropical rainfall releases significant heat in the atmosphere, which can influence large-scale atmospheric circulation. The shift in location and intensity of tropical rainfall patterns results in shifts in the location and intensity of the jet stream and storm tracks, tropical cyclones and more. Because each El Niño and La Niña event has unique characteristics of timing, intensity and specific pattern changes, such shifts are never exactly the same during every El Niño and La Niña event. In addition, the atmospheric effects due to changes in sea-surface temperatures are responsible for only part of the regional climate observed; chaotic fluctuations within the atmosphere and sea surface temperatures in other areas of the globe also influence the weather and climate we experience. Because of this, anticipated ENSO impacts in seasonal forecasts are treated probabilistically and not with absolute certainty. 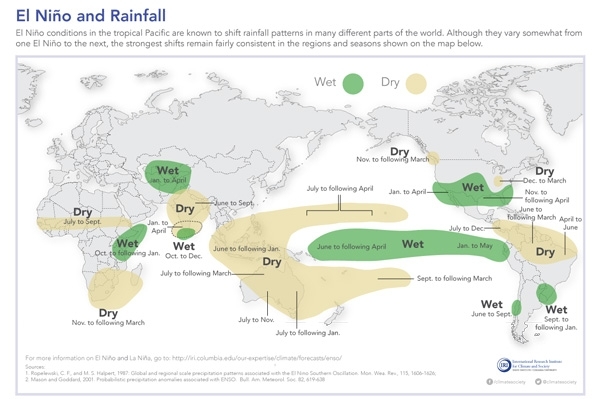 Typical rainfall patterns during El Niño events. Such teleconnections are likely during El Niño events, but not certain. Map from IRI Data Library Maprooms. During the two strongest El Niño events of the twentieth century (1982-1983 and 1997-1998), the global impacts of altered climate patterns extended to disease outbreaks, natural disasters, limited water availability, disruption to hydropower energy generation, and animal migration. It should be noted that the ENSO impacts during these years were not necessarily more disastrous than climate and weather events in years lacking an influence from ENSO. The difference is that the ENSO impacts can be related to a specific and predictable climate phenomenon, whereas for many climate and weather events, scientists cannot trace the cause of an event to such a phenomenon. El Niño and La Niño aren’t the only influences of climate around the world. Visit our climate variability resource page to learn more. Among the effects of past ENSO teleconnections is the brown locust outbreak in southern Africa, which is associated with early winter rainfall. Such early rainfall can also lead to drought, crop failure and famine. During El Niño years, western Florida is more likely to experience above-average precipitation, in turn leading to increased water runoff and groundwater discharge during heavy rainfall. On the other hand, El Niño also tends to reduce the number of Atlantic hurricanes, and winter in the northern U.S. is usually more mild than average. Finally, La Niña years can bring more frequent and more damaging hurricanes to the western Atlantic Ocean. For other areas that typically see ENSO impacts, visit our map room. All of that is because of ENSO? At any given time, many processes are ongoing in the atmosphere, on land and in oceans all over the world. It is difficult to determine exactly which climate and weather events are a result of El Niño or La Niña and which are a result of other natural climate variabilities. ENSO is a strong force, however, and in many areas it is the most dominant influence on seasonal climate. Because of the uncertainty that climate variability presents, scientists cannot guarantee particular outcomes, but climate prediction can still be accurate a few months ahead of time. Climatologists and decision makers can anticipate future ENSO impacts by studying its past effects. Although prediction involves uncertainty, the seasonal climate effects in some regions tend to shift in a particular way and thus result in a more likely set of impacts. For example, tropical regions are affected more strongly by ENSO, and while they may be at a higher risk for certain hazards, that also means that we may better anticipate these hazards and prepare for them. Additionally, when good weather is predicted for an upcoming season, decision makers can capitalize on the forecast. Farmers, for example, can plan for a good season by planting additional or different crops, or by buying fertilizer to further increase their yield. A farmer may be less likely to make these investment risks in a bad year, but if he or she knows that it is probably going to be a good year, these risks can pay off. An area’s vulnerability to climate risks is also informed by its unique sociopolitical and economic characteristics. For example, a country in peacetime with developed infrastructure, highly organized emergency management, irrigated agriculture, and a well-informed population will be well equipped to respond to fires, floods, droughts or crop failures, even if it is in a climate-vulnerable region. On the other hand, a country with fewer resources may be more vulnerable to climate risks, even if it is in an area that typically sees fewer climate hazards. Preparing for the effects of ENSO therefore requires understanding the geography, vulnerability and culture of a given area. Responding and adapting to climate risks requires significant organization. While the best time to create plans for preparedness for ENSO is when no event is occurring, this may be challenging in many areas. IRI provides a number of prediction tools and forecasts, as well as on-site training events for users with different skills and capabilities. Leaders and decision makers of various sectors – disaster management, public health, agriculture, water resources, etc. – can cooperate and communicate to ensure that resources are shared, information is up to date and accurate and that response is equitable for all stakeholders. Finally, the media can play a strong role in communicating risks by providing accurate information to the public. Qian, J.-H., A. W. Robertson, and V. Moron, 2013: Diurnal Cycle in Different Weather Regimes and Rainfall Variability over Borneo Associated with ENSO. J. Climate, 26, 1772–1790. DOI: 10.1175/JCLI-D-12-00178.1.